The Estació Maritima ferry and cruise pier, which is next to the yacht basins and about a 40-minute walk from the city center. Most ships dock at this modern terminal. Only some ships dock near the commercial and naval port near the fortress at Porto Pí, which is on the western edge of Palma. The cruise pier is a 75- to 90-minute walk from the main tourist sights, but you'll find a large shopping mall near the port entrance. For the energetic passenger it is possible to walk (6 kilometers) from the cruise terminal to the old city of Palma along the curving sea front, where you will pass the yacht moorings in the inner bay with the commercial moorings beyond. As you make your way along the sea front you will eventually come to the old city and tourist area on your left with its restaurants, museums, places of interest, hotels, bars and shops. For those of us less energetic mortals a local taxi will transport you to the Cathedral, a good place to start and finish your tour. The taxis are all metered and fairly expensive but plentiful. The cost for a trip into town is about 10 euros. There is also a regular bus service into town. (Every 15 minutes bus nr.1. ) 1.50 Euro to town, 3 Euro to the airport. The Hop on/off bus (see below) has a stop right in front of the cruise terminal. Also, most cruise lines offer a shuttle from the port to a central point in town near the Cathedral. (12 Euro). So bus #1 is a much better deal. Passengers arriving at Palma from a Mediterranean cruise may check in their luggage at the port of Palma. 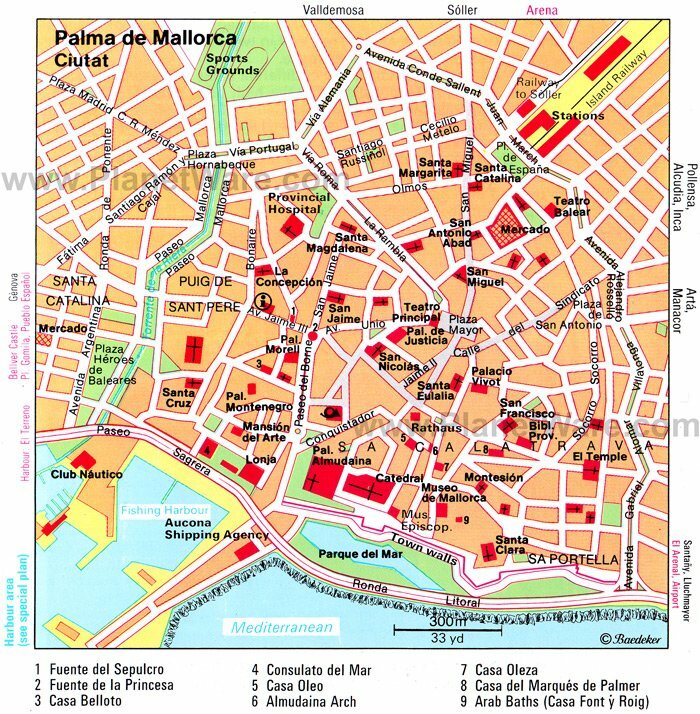 This means that prior to travelling to the airport for their flight, they can enjoy the city of Palma unburdened by suitcases and already in possession of their boarding passes. Bus 1 takes you direct to and from the airport. The Port of Alcudia is situated in the north of the island of Majorca, in a lovely bay. It is a small commercial port suitable only for dropping anchor in order for passengers to go on excursions around the beautiful north coast. Check here for festivals and events in Mallorca when you are in port. The city is dominated by its wonderful Gothic cathedral, La Seu, and most of the main sights are located within the area bounded by the old city walls, especially to the north and east of the cathedral. Both the cathedral La Seu and the Palau de l'Almudaina (Royal Palace) are on the harbor and worth a visit, as are the nearby ancient Moorish baths (Banys Arabs). As you stroll away from the palace area back towards Plaça d'Espanya, you might want to take the Passeig des Born, a tree-lined boulevard that many see as the heart of city life. Another must-see site on this walking tour is the old Gran Hotel, Palma's first luxury hotel, now a museum of modern art called the Fundació la Caixa. Its trendy cafe-bar is a good choice for lunch or a snack. Turn right off the Passeig des Born onto Carrer Unió. The Fundació la Caixa is on Carrer Unió near the Teatre Principal and the Plaça Weyler. The easiest way to "see Palma in a day" is Palma de Mallorca City Hop-on Hop-off Tour, which also takes you to Castell de Bellver, which offers stunning views of the city, from a castle like setting. The monumental compounds of Valldemossa rise between Sierra de Tramuntana and the Mediterranenan, a few kilometers away from the Majorcan Costa Nord. The city's careful layout is filled with steep streets, stone façades and important religious buildings, among a luxuriant vegetation. The mountains of this area dive into the ocean, to form beaches and coves where it is possible to anchor any vessel. The port of Valldemossa preserves the fishing-town character of yore. Fresh fish and inland produce are wisely combined into succulent recipes that will delight visitors. Chopin and George Sand spent the winter of 1838-9 here in the old monastery. In spite of the beautiful view and general comfort of what is described as a cell, they were not happy and George Sand wrote a book which may well not have led the locals to want them back. Soller is located on the north coast of Mallorca. You can get there with the train from Palma de Mallorca-Plz Espana. It is a nice cool place to visit in summer month. From Soller there is the famous tram to Puerto de Soller. Shopping: In the atmospheric and often pedestrian streets of the old city. There is a small but very competitive priced duty-free store in the terminal. As in other parts of southern Europe, the siesta is alive and well in Palma. Many shops, churches and museums close in mid-afternoon for several hours. Larger store however stay open. An Internet cafe is located in Porto Pi center. It is open from 10 a.m. until 10 p.m. daily. Plenty of Cappuccino cafes and other fast food outlets offer free WiFi in town.